Slip related injuries represent a very high percentage of workplace and home accidents. These accidents can cause painful medical problems, long term disabilities, lost productivity, extensive financial losses, legal entanglements and insurance difficulties. According to the U.S. National Safety Council, every day more than 25,000 people go to hospital with injuries due to slip / fall accidents. Slip / fall accidents are the second leading cause of accidental death after automobile accidents. Slips and falls are the leading cause of death in the workplace and the cause of more than 20 percent of disabling injuries. Slip / falls are also the number one cause of injury in hotels, restaurants, public buildings and make up nearly half of all home accidents. The total expense resulting from slip / fall injuries is a $100 billion problem. In order to make floors safe, it is important to apply the appropriate anti slip product on the correct surface, with the proper surface preparation and then to maintain the surface appropriately. The nature of the traffic and the nature of the floor surface are to be considered. Areas designed for heavy vehicular traffic require a more aggressive and durable product than areas designed for pedestrian foot traffic. When contaminants combine with a naturally smooth, non porous surface such as steel, concrete, tile, slips and falls are the result. No Skidding Products have developed the most complete range of floor safety products in the world to address this and draws on three generations and over 40 years of experience in coatings & chemicals technology. Our products are designed for situations ranging from industrial applications with vehicular traffic to commercial applications where aesthetics are as important as safety. Our products are in use in over fifty countries around the world and in use in dozens of market segments, including: Hospitality, Restaurants, Industrial, Health Care, Marine and Yachting, Public Transit, Recreational Vehicle Safety, Transportation, Military, Schools and Universities, Municipalities, Aircraft, Theatre, Financial, Mining, Stadium and Sporting facilities and Residential. We also specialize in custom and OEM applications. 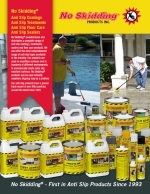 www.Noskidsafety.com is your one stop destination for anti slip products including the most complete range of easy to apply anti slip treatments, coatings, tapes and floor care products available. 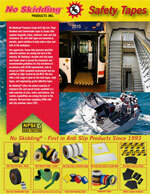 Our products are designed to help protect workers, customers, and pedestrians from dangerous slips and falls. We ship from within the US and Canada depending upon which location is most convenient and efficient in terms of expediting your order. We invite inquiries from dealers, industry and OEM for technical support, volume pricing and product data sheets. Please visit www.noskidding.com for more detailed information on the products listed on this e-commerce site. Let us be of service to you.